You can add as many catalogs as you offer with the Catalog Request Editor. By requiring certain fields in the request you can ensure you gather the information you need to build your prospect database. Images of the catalog and their corresponding description helps your customers order the proper catalog saving you time and money. Make it easy for your customers to request one of your print catalogs or other marketing pieces. 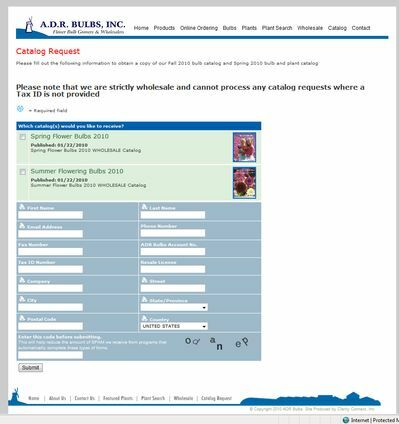 You can add as many catalogs or marketing pieces as you need and have the contact form adjusted to capture the information you need before you're willing to ship a catalog. Moving your cursor over the small catalog image displays a larger version for easier viewing. This functionality can be available for anyone or after login to limit it to a specific audience. We can also add a quantity requested.